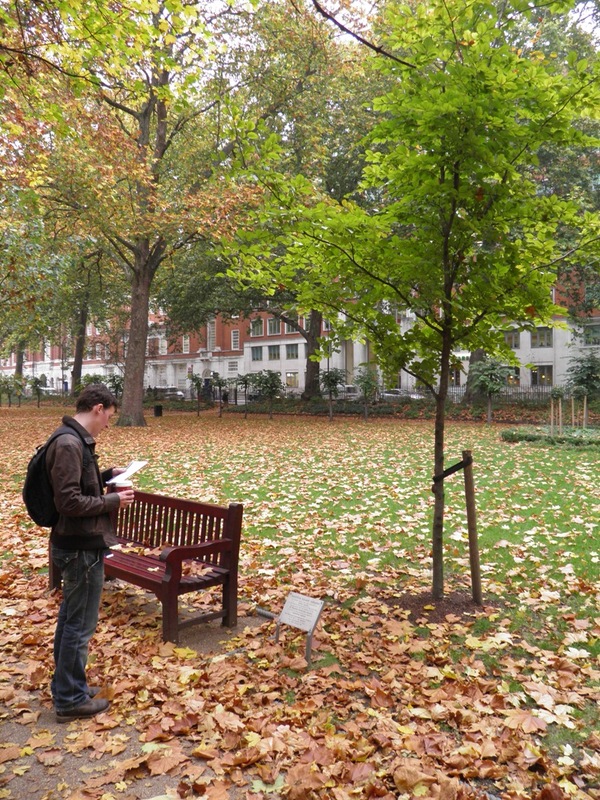 On the SOAS campus in Bloomsbury is a small plaque unlike any other in London. 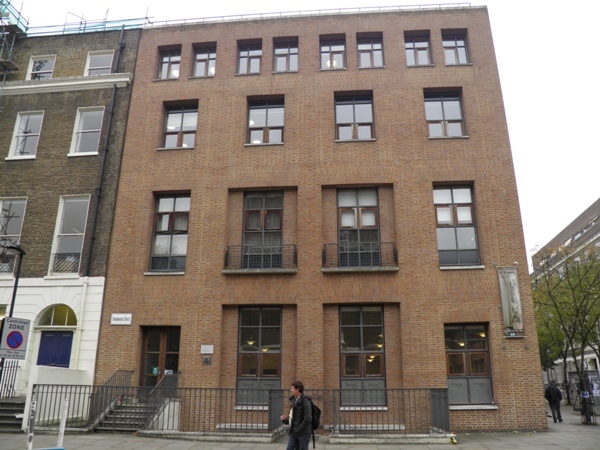 The building in Thornhaugh Street is the only one in London to bear a sign apologising for being built. 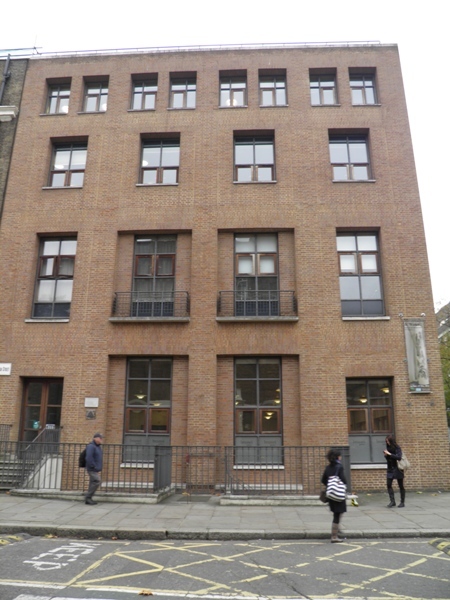 UCL erected the building in 1988 as the Brunei Gallery – an extension to the School of Oriental and African Studies which operates as “an exciting venue in Central London…[hosting] a programme of changing contemporary and historival exhibitions from Asia, Africa and the Middle East”. On top is a Japanese roof garden. All very unobjectionable, you might imagine. You’d be wrong. The University is on land which is managed by the Bedford Estates, a trust which benefits the descendents of the aristocrats who bought up the vast empty fields of what would become Bloomsbury three centuries ago. 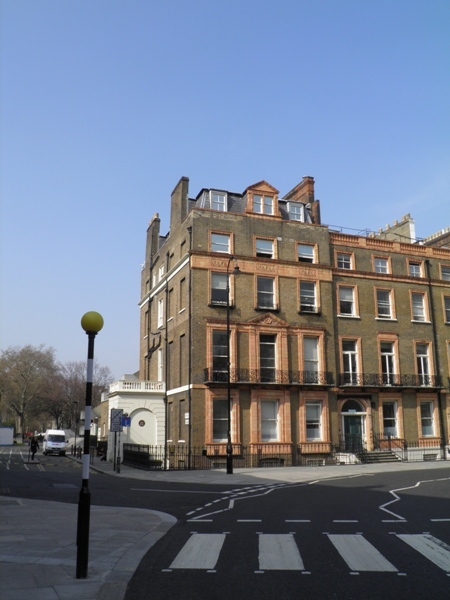 In 1669, the huge Bloomsbury Estate came into the ownership of the Russell family through marriage. 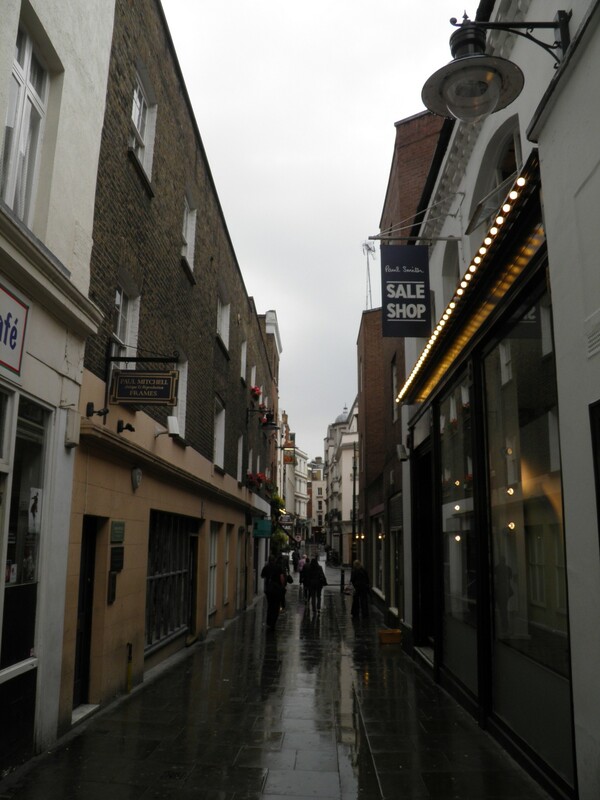 Their land stretched from present-day Euston Road to the north, Tottenham Court Road in the east, and all the way down to Covent Garden to the south – a nice accompaniment to Woburn Abbey, which had been gifted to them by Henry VIII following the dissolution of the monasteries. 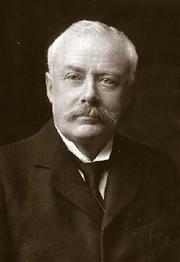 The Russell family, who were given the title of Duke of Bedford shortly after they came into possession of the land, remain the owners of much of the area to this day. 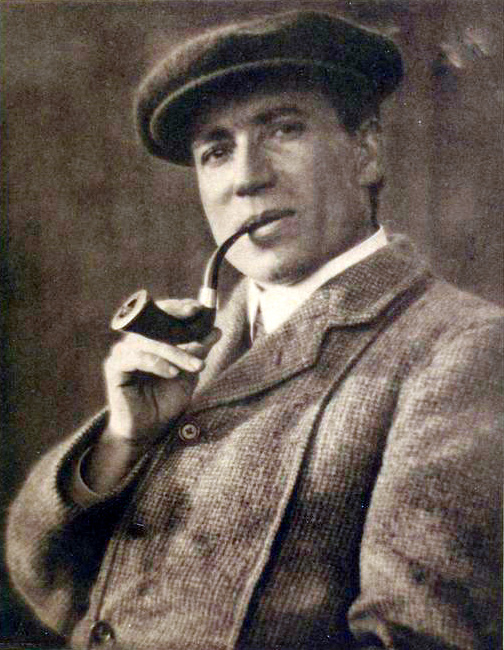 Piecemeal building schemes continued throughout the centuries, but in 1893, the 11th Duke, Herbrand Russell (1858-1937), felt political and popular feeling was turning against the owners of the large London estates, living as they were in a manner which was entirely alien (and alienating) to most of the population. Worried that their visibility and proximity to the masses might make them vulnerable, he made the decision to sell the majority of the family estate to developers, although many of the pre-exisiting developments remained in the family’s vast property portfolio. 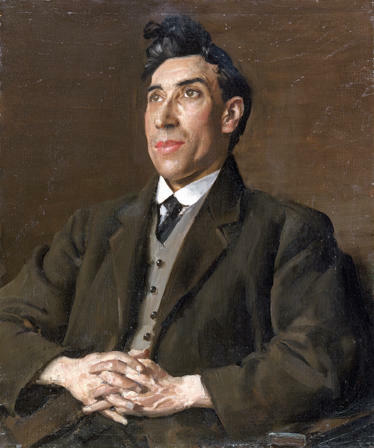 One of the many institutions who bought land from the family in the 1920s was the University of London, in an era which saw the tone of the neighbourhood shift from the residential to the academic. Throughout the twentieth century, the Georgian houses were taken over by publishing companies, who converted the decent-sized rooms into individual offices. 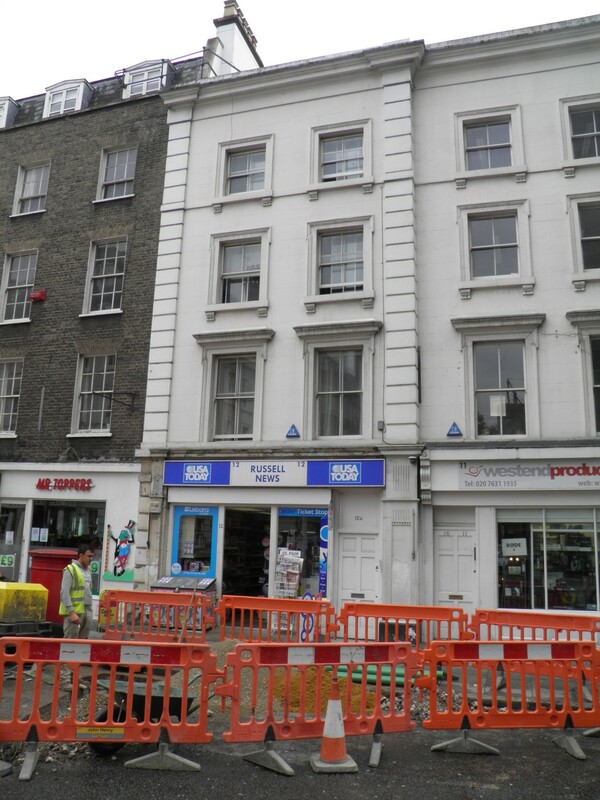 On the other side of the road from the Brunei Gallery are the former offices of Faber and Faber, a blue plaque dedicated to one-time employee TS Eliot upon the wall. 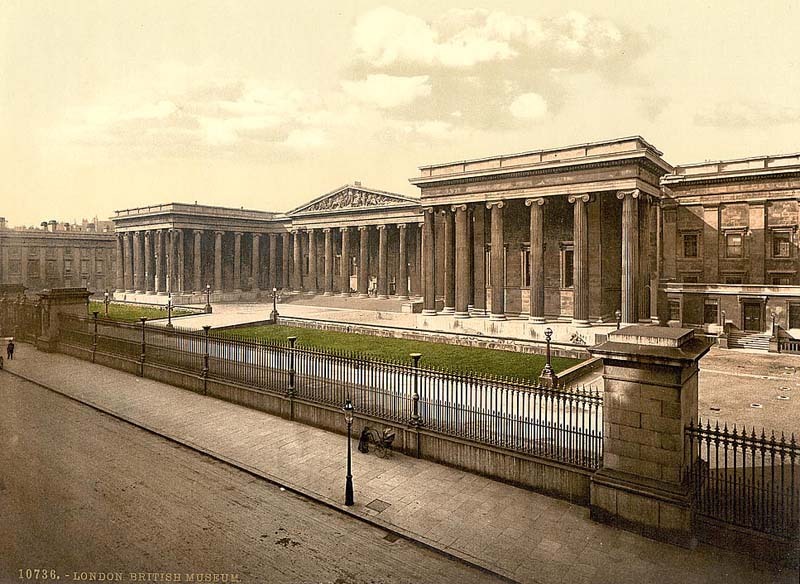 While the Russell family have long been unable to prevent the British Museum and the University encroaching into their estate, as educational institutions were given the legal right to compulsarily purchase land when they needed to expand, one of the conditions of sale was that the Bedford Estate retained the right of approval on buildings which fronted onto certain viewpoints. And one of the viewpoints they have approval on is when buildings – just like the Brunei Gallery – face onto Russell Square. 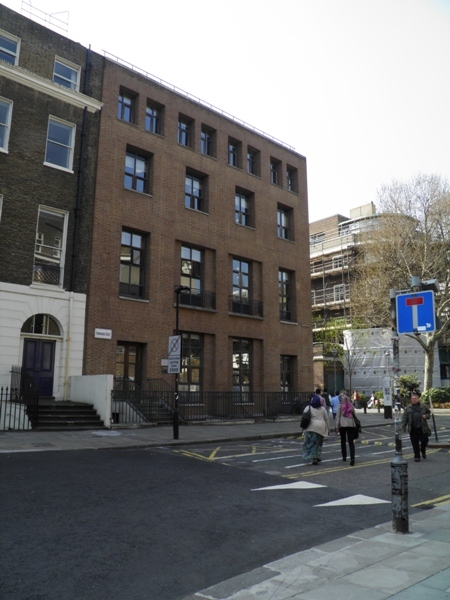 The Bedford Estates were consulted in the early days of the SOAS project, but, in their words, “the university slightly pre-empted the issue”, and the design was fixed without the consent of the Estate. 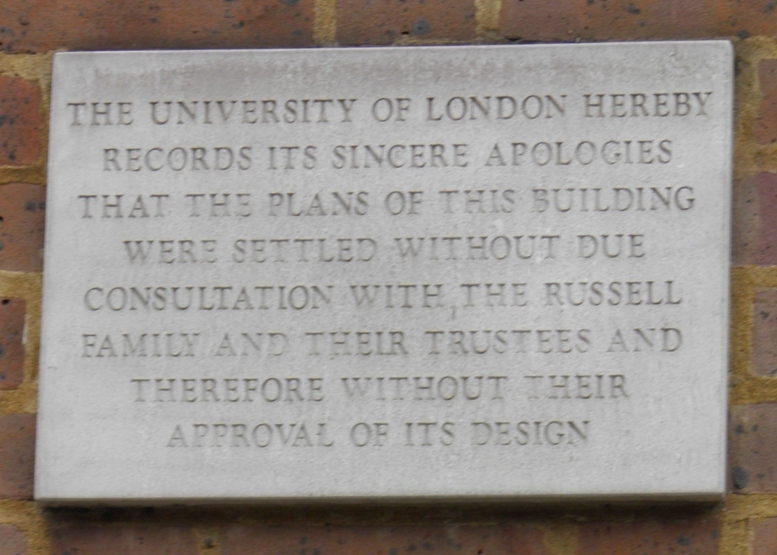 Thus, when the University set about leasing the new building to SOAS, the apologetic plaque was demanded by the Bedford Estate, who specified the exact wording, size and materials to be used. 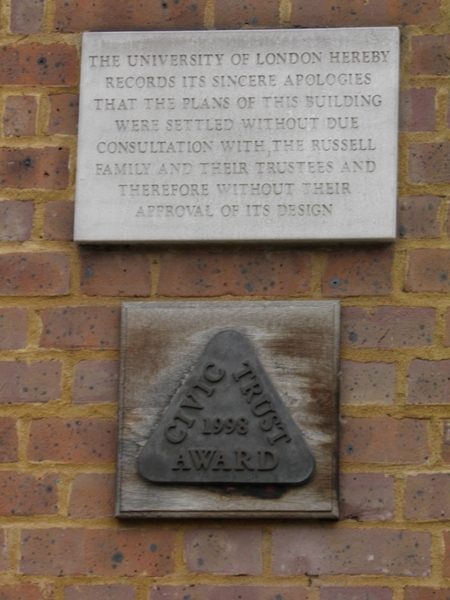 Essentially, the only reason the plaque is there is as a point of principle. 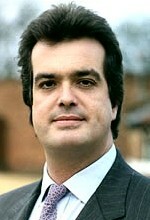 The current Duke of Bedford is the 15th, who succeeded to the title in 2004. Today’s Bedford Estate consists mainly of “residential property converted to office and small hotel use and private residential property.” It also includes lock-up garages and a number of squares, both public and private. That list rather downplays the scale of his empire which the Sunday Times estimated in 2011 had given him a fortune of over half a billion pounds. And, since 1988, a prime view of London’s sorriest building. The area between Bloomsbury and Euston is a strange part of London. The wide empty roads run between towering buildings set around a series of large, flat, featureless squares. Most are canopied by vast trees. With no shops or businesses along the road, and large silent academic buildings fencing the squares in on both sides, there aren’t often many people around. 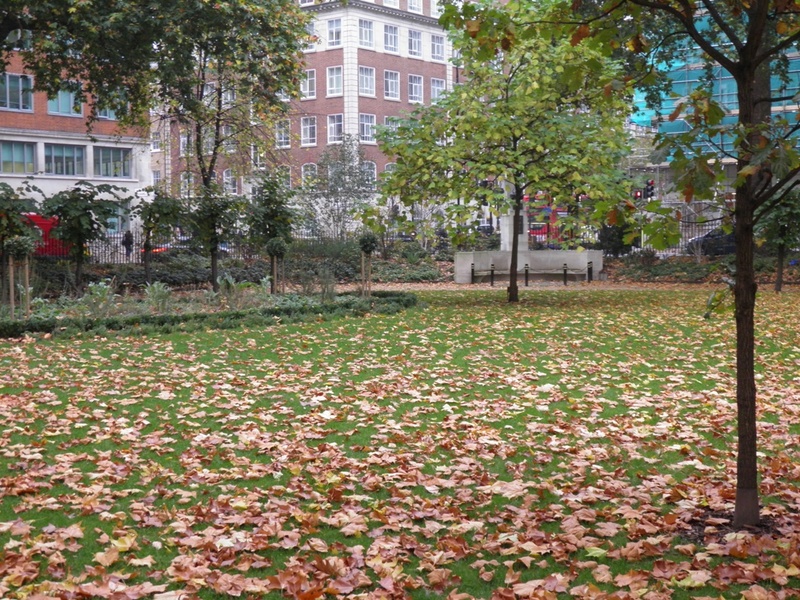 The squares are consequently unusually (almost eerily) quiet for a central London location. The people in the squares are so unaccustomed to having company, they often look up as you wander in, stare suspiciously for a while and hesitatingly dip back into their books. Whenever I’ve been into one, there are only ever a couple of solitary UCL students sitting on a distant bench, or a runner briefly diverting through the grass before popping back on the road. Like me, many of them must half-wonder if the squares are private and just be waiting for someone to come over and angrily ask them how they got in and what the hell they think they’re doing. It’s the type of place you half expect to spot George Smiley whiling away the hours waiting for a contact to arrive. 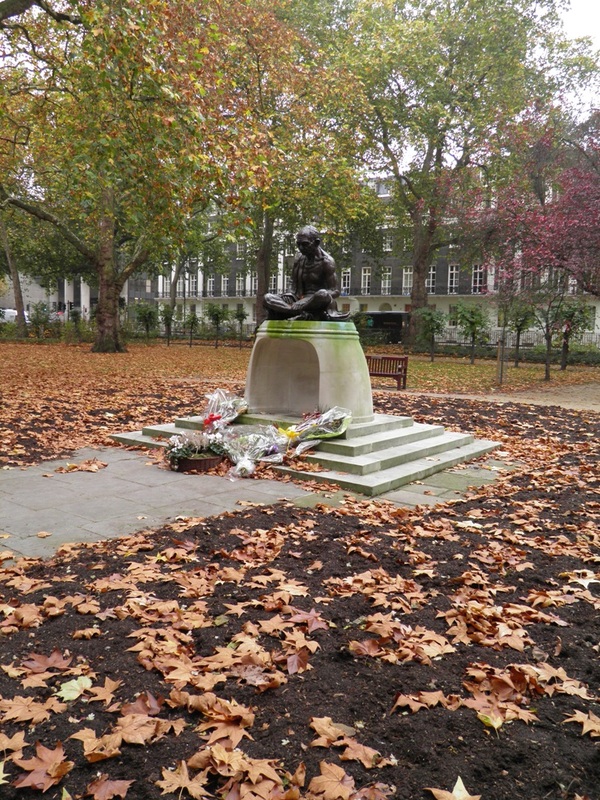 Tavistock Square Gardens are much the same as the neighbouring seven squares, but the large statue of Gandhi in the middle means there are usually one or two Indian students hanging around at the gates, some of whom leave handfuls of fresh flowers at the base. A tree, planted by the then Indian Prime Minister Nehru in 1953, grows in the south-east of the square. But close by the tree there’s something which doesn’t grow. Long before the area was laid out as squares and terraces at the end of the 1700s, it was known as Southampton Fields. Unlit, undeveloped and on the far edge of seventeenth-century London’s sprawl, it was a popular haunt for lovers who picked plantain, a low growing herb, for it’s supposed aphrodisiac qualities. In this unnatural act – brother killing brother – the very ground on which their blood had been spilled is said to have revolted. 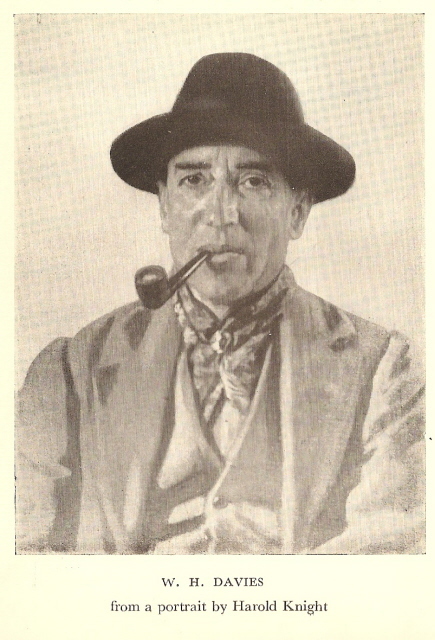 The scene soon became known as the Field of the Forty Footsteps, a phrase coined by one “Miss Porter and her sister”, who heard the story and used it as the basis for a romantic novel. 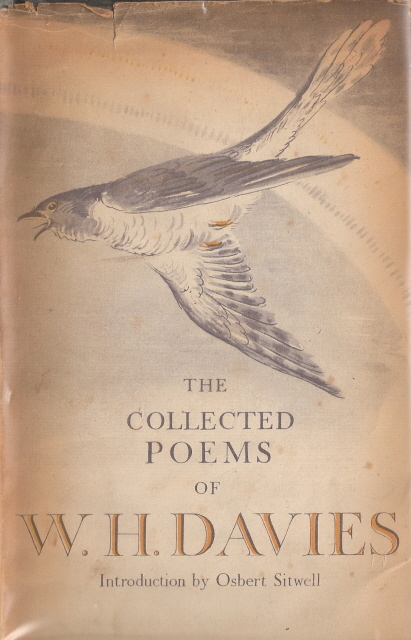 We sought for near half an hour in vain…We were almost out of hope, when an honest man, who was at work, directed us to the next ground, adjoining to a pond. There we found what we sought…The steps are of the size of a large human foot, about three inches deep, and lie nearly from north-east to south-west. We counted only seventy-six; but we were not exact in counting. 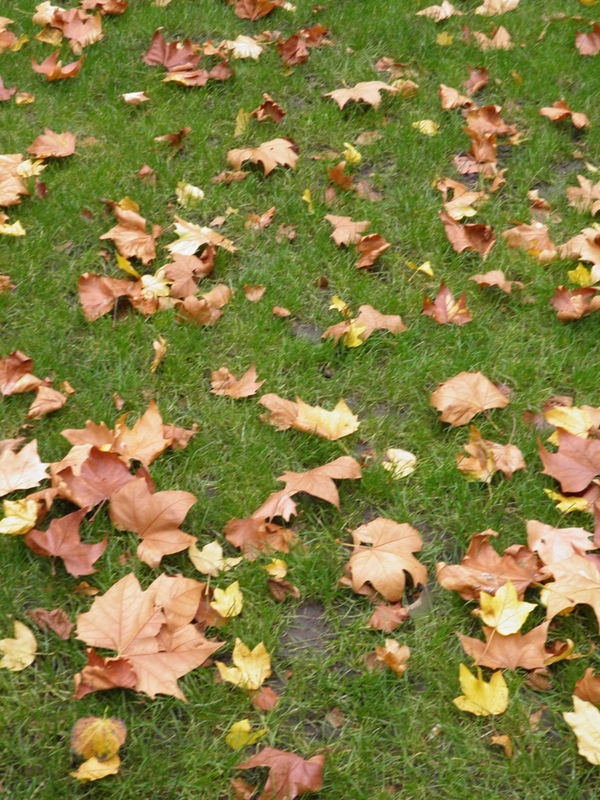 The place where one or both the brothers are supposed to have fallen is still bare of grass. The labourer also showed us the bank where (the tradition is) the wretched woman sat to see the combat. In 1800, the author of Commonplace Books, Joseph Moser, claimed the footsteps were built over as the terraces were erected. June 16, 1800. Went into the fields…and there saw, for the last time, the forty footsteps; the building materials are there, ready to cover them from the sight of man. I counted more than forty, but they might be the footprints of the workmen. 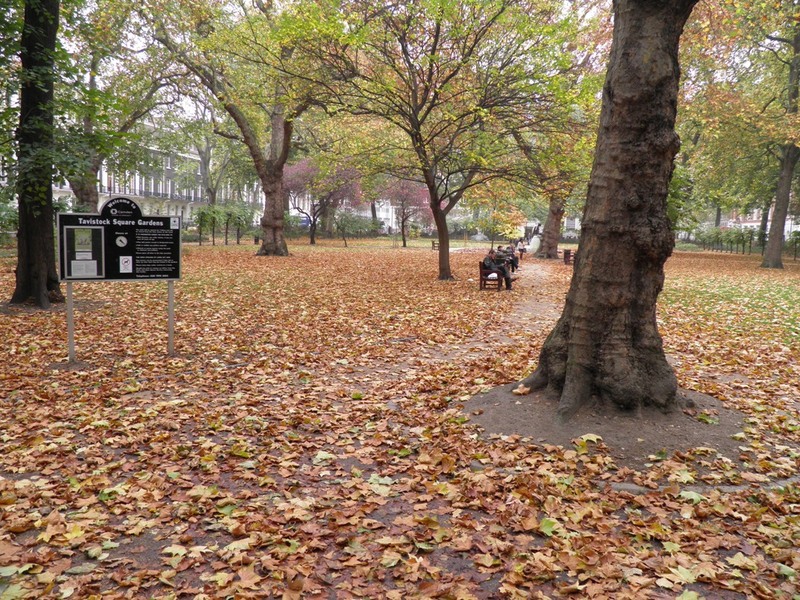 Huge numbers of London books over the centuries have retold the tale – but none of the authors I’ve read actually bothered to see if these footsteps were still in Tavistock Square. So I went with my camera to see if they were. I know – it’s silly. I was looking for patterns. 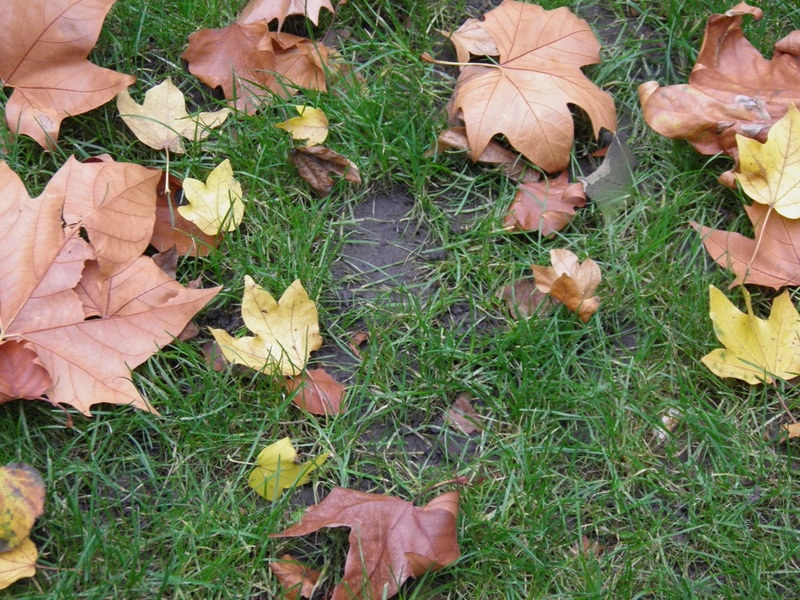 Look at the mud in any park you chose to go into, and you’d find similar shapes. The mind tricks the eye into seeing what it wants to see. But whatever the real explanation is – mental suggestion, an ancient fraud, or some botanical fungus that kills those particular portions of grass – it sure looks to me like a row of man-sized footprints walking in a straight line exactly where the old books said they’d be.